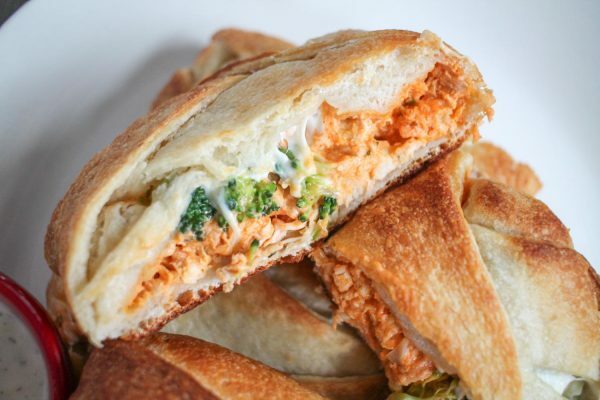 This Buffalo Chicken Calzone is filled with tender shredded chicken drowned in spicy buffalo sauce, broccoli, and mozzarella. It’s delicious dipped in ranch or blue cheese. 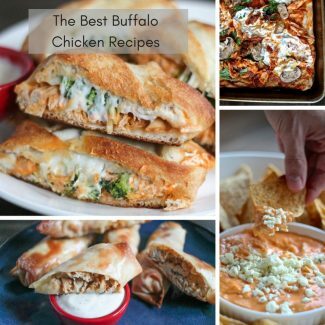 Something happened when I moved to the Midwest and I have become obsessed with buffalo sauce and ranch dressing. 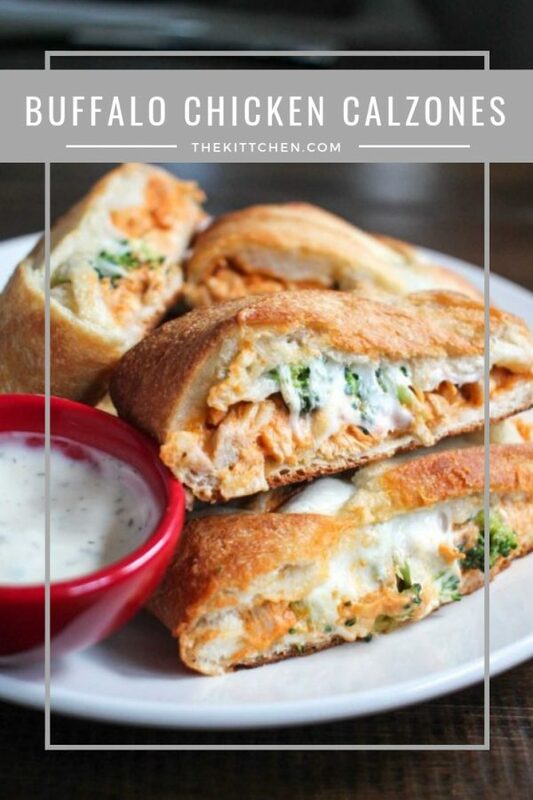 I will even put them on my pizza… which inspired this recipe for a massive family style, Buffalo Chicken Calzone! It is a recipe that requires few ingredients and just a few minutes of preparation time. It is just the thing to snack on while you hang out at home watching sports or binge watching Netflix. 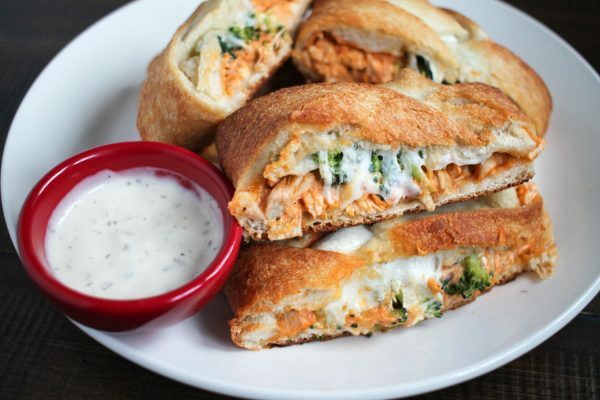 Serve this Buffalo Chicken Calzone as a meal or a snack. It is big enough to be a meal for two people, and to be honest I added the broccoli to help justify eating this as a meal. 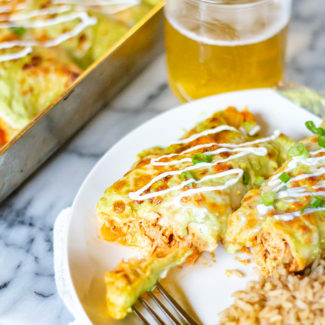 The cheese and the buffalo sauce overwhelm the taste of the broccoli, so even people who don’t like broccoli (ahem… my husband and George Bush) won’t mind it here. The broccoli serves to add a nice fresh crisp texture while boosting the calzone’s nutritional value. This recipe comes together very quickly and easily. 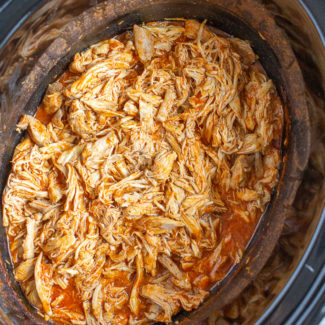 Chop up rotisserie chicken – or leftover chicken, season it with dry ranch dressing mix and buffalo sauce, and stir in a bit of cream cheese. 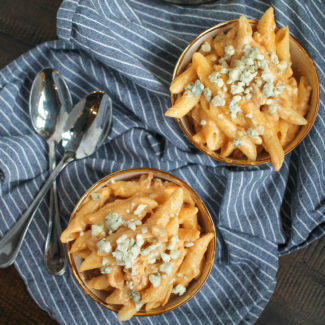 The cream cheese adds a nice light cheesy flavor that tones down the heat of the spice. 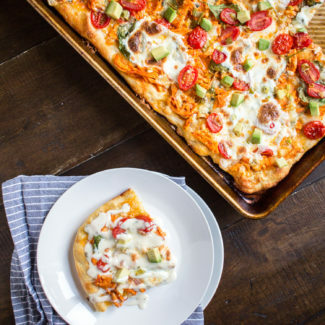 The chicken mixture gets spread out on the pizza dough, topped with broccoli and mozzarella, and then the pizza dough is braided over the fillings. 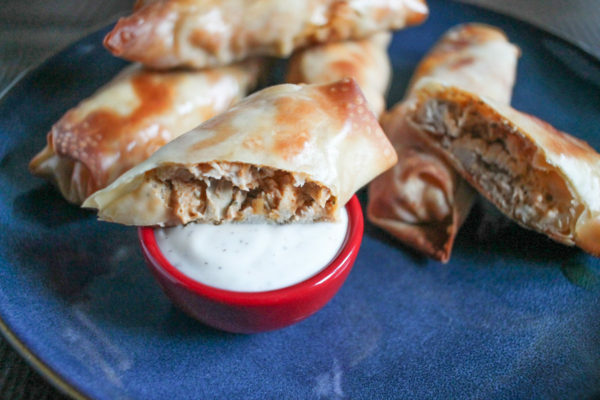 You could opt to use blue cheese instead of mozzarella, but I recommend mozzarella since it melts so well and helps to hold the ingredients inside the calzone. 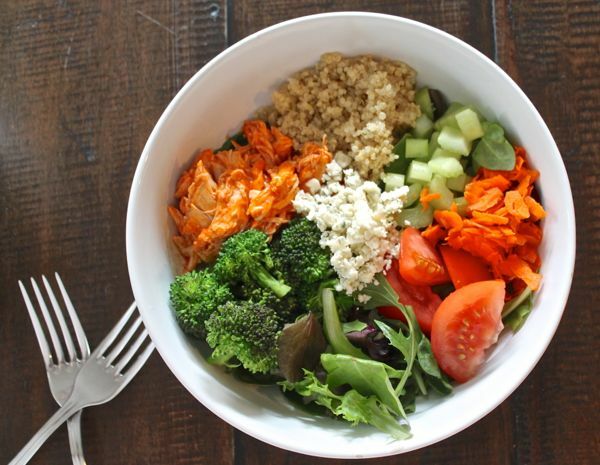 This recipe for Buffalo Chicken Quinoa Salad is a healthy way to get your buffalo fix. 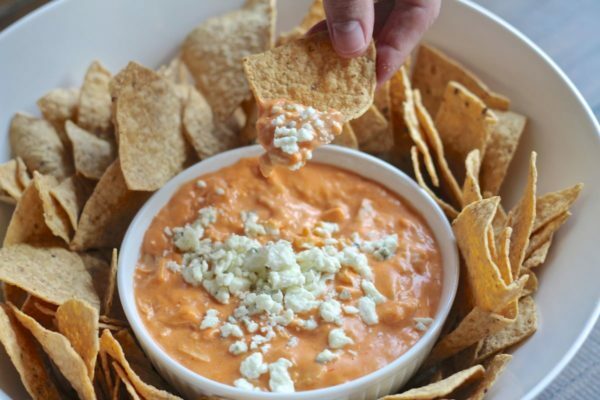 A thick creamy Buffalo Chicken Dip is a wonderful appetizer to serve a party. 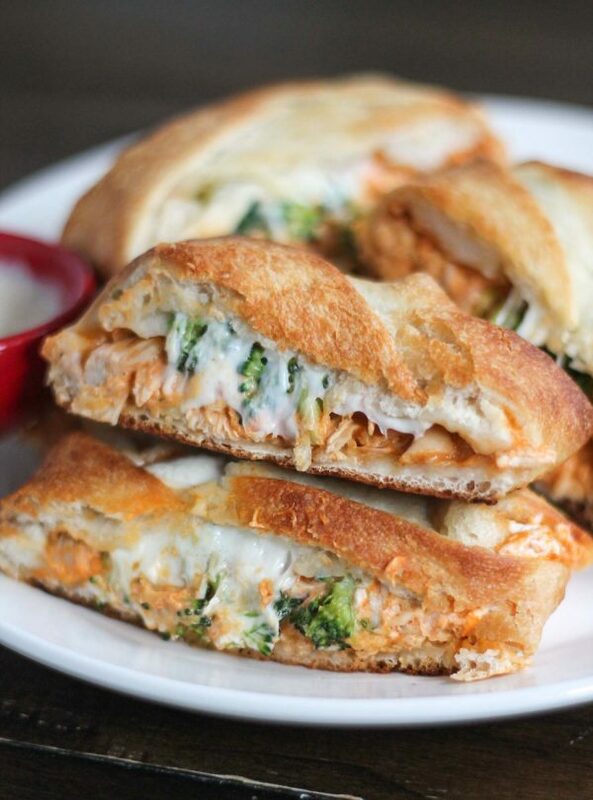 And Buffalo Chicken Eggrolls are made by rolling up buffalo sauce soaked chicken and cheese in eggroll wrappers. Start by dicing up the chicken. 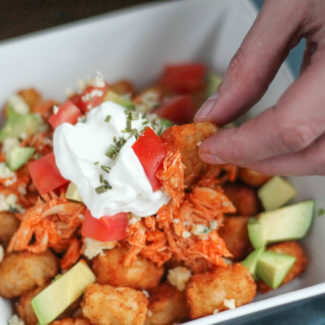 Place it in a bowl and add the buffalo sauce and the ranch dressing. 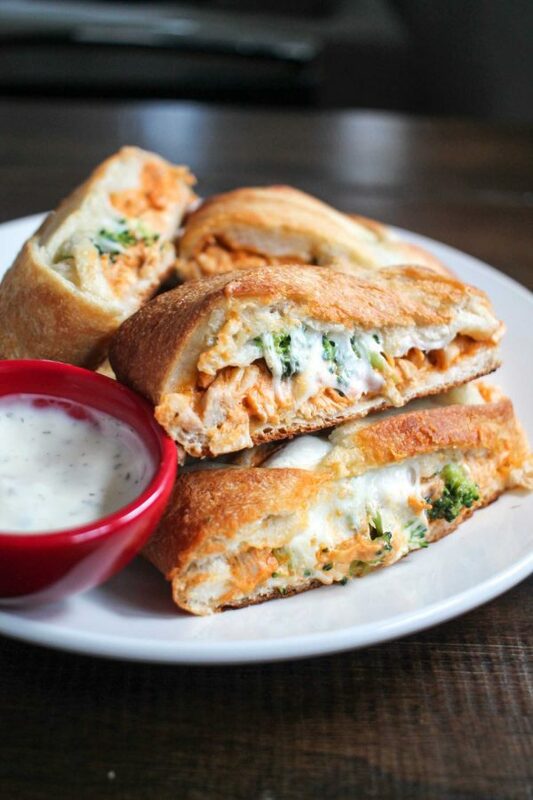 You might want to slowly add the buffalo sauce to taste. I added just about 1/3 cup and it was pretty spicy. Then mix in the cream cheese. Set aside. Rinse the broccoli in water and then chop it into small florets. Microwave it for 30 seconds, until it is about half cooked. I just used the 30 second button on its standard setting. Lay the pizza crust out on a work surface – flour the surface if necessary. Spread the chicken mixture down the middle of the dough. Top with the broccoli and then the mozzarella. Next you need to fold the dough together. 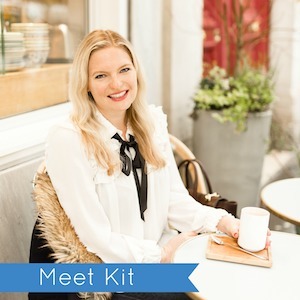 Take a look at the photos in this post to see how I sliced off the corners of the dough, and sliced strips down the sides of the dough and folded them over each other. Bake for about 15 minutes, until the crust is golden brown. Slice and serve with ranch or blue cheese dressing.